Issue opens with Skin and Chamber, not really liking their odds for success. Skin is narrating this issue. We see that Apocalypse mutant goons mistreat flatscans horribly. One of them kills a young girl’s father, as he was giving his daughter three day old food – from their last meal. It takes all of Skin’s strength to keep Chamber from lashing out. Skin wants to wait, until they actually have a chance at winning. We do see that Skin camouflages himself to resemble a guardrail and as the guy who killed the father is leaning on it, Skin allows himself to relax and the mutant guard falls to his death. Elsewhere. We see Husk and Vincente, still masquerading as the Chief Administrator of Mutant Resources. They are surprised that they have made it as far as they did, into the Core. They are in Quietus’ office and can’t find any records on Illyana Rasputin. Sugar Man is outside of Quietus’ office, we learn that Sugar Man is Quietus’ boss as well as the boss of the entire Core operation. Once inside, “Quietus” is having a shower, trying to hide his new scent. Sugar Man explains that Shadow King noticed someone going through their files. A possible break-in is suspected. Inside the shower, we see that Husk only has Quietus’ head and it is her body onto of Vincente’s actual form. Sugar Man laughs at the idea of a break-in and leaves. Once they are alone, Husk states how much she loves Chamber. Vincente states that is why she’s been a red head for the past year. At the Core Entrance. 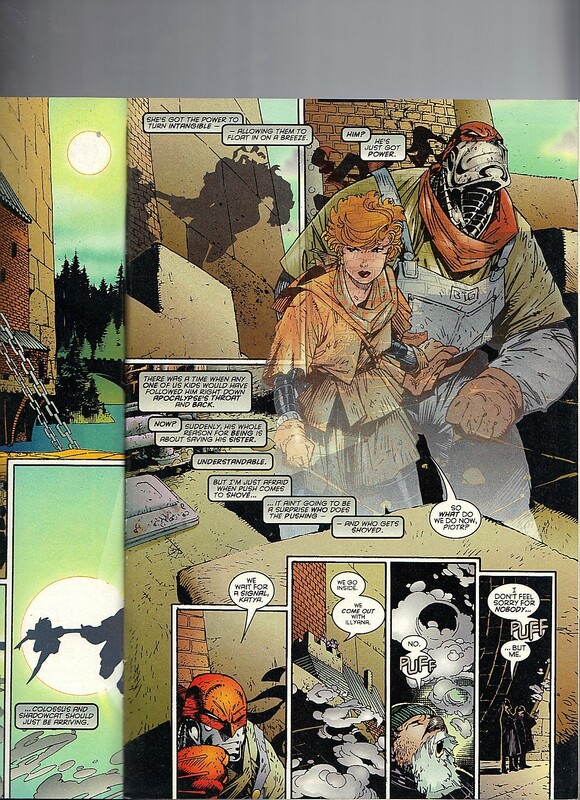 Shadowcat is phasing herself and Colossus through walls. Her phasing makes it possible for Colossus to be as light as a feather. Skin narrates that he has also noticed that Colossus has become reckless, only caring about getting his sister back. The two teachers are going to wait for a signal. Below. Illyana asks an older lady, May, to describe sunlight. One of the guards pushes Illyana’s new friend off a cliff. Luckily, Mondo is there to save the girl. Is Mondo not Skin? That might explain my confusion about the two of them. Reading these again, I do recall a sense of confusion of what was happening. Maybe I didn’t buy these in order, back in the day, reading them as I bought them. Okay, Mondo and Skin are two different people. Skin and Chamber are still on the surface. Malibu Comics must be a thing, or Marvel’s ownership is, as there is a two page ad for Prime vs Incredible Hulk, as it is a mail order comic for Ultraverse. $10 for the comic or $40 for the Super-Premium version, signed by the creative team and has a metallic ink cover. “Quietus” finally catches up with Skin and Chamber. They can tell it is Husk, pretty quickly. Above. Know-It-All is providing an update to the married couple. Things are not going well. Shadowcat wants to go down there but Colossus doesn’t want to risk being detected. Sugar Man likes that Quietus is getting rough on two intruders. Sugar Man wants Quietus to kill them, “he” pauses but agrees to do it. Quietus aims his gun but Sugar Man stops him. Why use a gun when he has his sweet mutant power. Quietus tries to make a few excuses but mostly, Husk doesn’t know what his powers are. While putting his new lady friend down, Mondo spots Illyana and promises to come back. Mondo grabs Illyana and makes a break for the surface. Know-It-All announces that Mondo has saved Illyana. 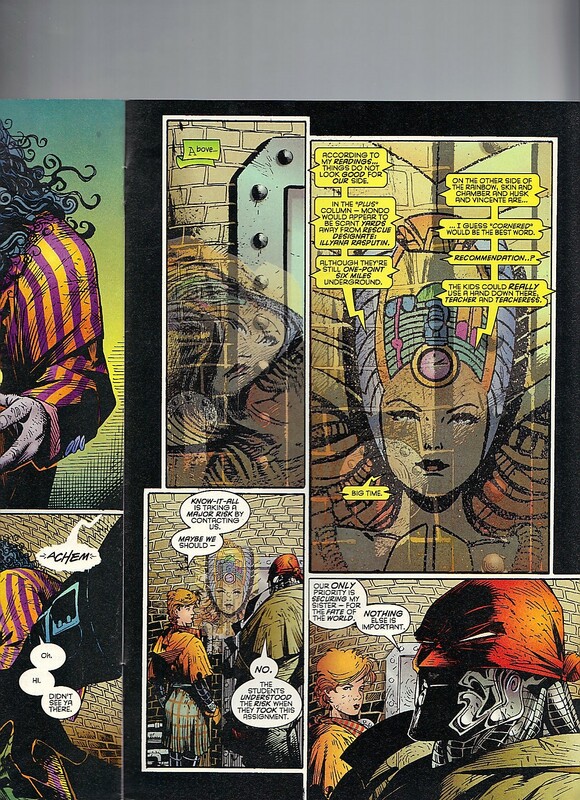 Mondo absorbed Illyana, so the more he uses his power, the more likely he make start dissolving her. Colossus tries to convince his wife to stay behind but she reminds him that they are together for better or worst. Colossus restates that she will always be the love of his life. We’ll find out if he really means that later. Not in this series, but later on in the event. Shadowcat wants one last “intangible fast ball special” and he tells her that there will never be a last one. Issue ends with Sugar Man giving Quietus the kill order. 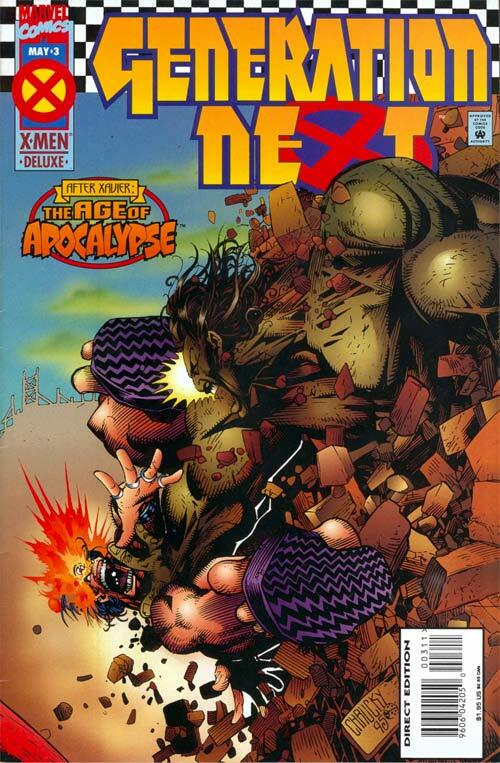 Generation Next 3 – The mission to rescue Illyana Rasputin takes a turn for the worst! And if Sugar Man doesn’t kill Chamber and Skin, it looks like Husk may have to for him! 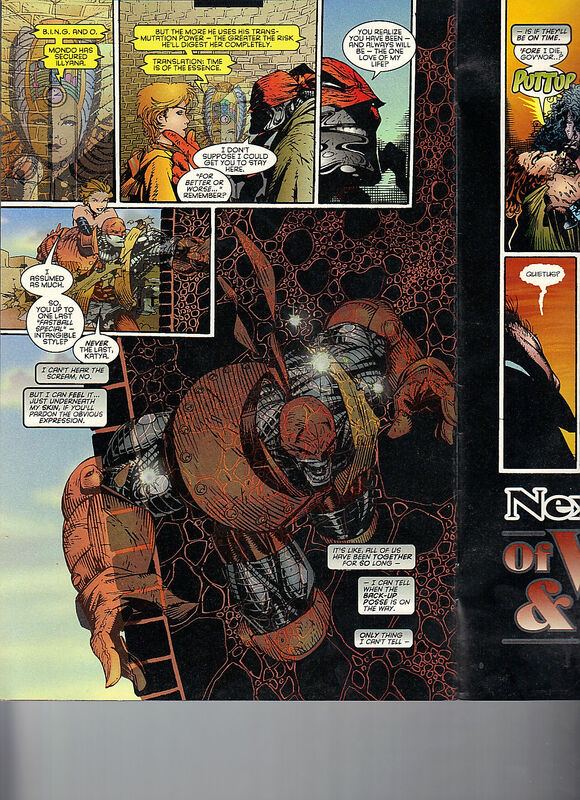 By Scott Lobdell and Chris Bachalo! One more issue to go!